Pink Floyd's Roger Water is 66 on 6 September - yes, 66 - yet the Floyd's music still resonates across generations with many fans still teenagers. Pink Floyd's in-fighting is the stuff of rock legend. 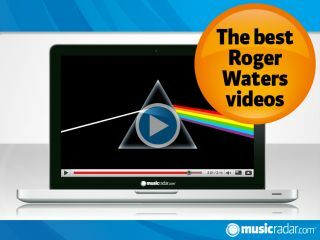 Waters was bandleader through Pink Floyd's biggest years, and their primary lyric writer. He might not have been always easy to work with, but Waters' drive and vision had much to do with their ascendancy in the '70s. A great TV time capsule. Floyd play a cut from their debut album, The Piper At The Gates Of Dawn. Even better, however, are the pre-performance comments from host and classical musician Hans Keller, who says he finds Floyd's music "a bit boring." Afterwards, Keller asks Roger Waters, "Why has it got to be so terribly loud?" To which Waters responds, "Well, I guess it doesn't have to be, but that's how we like it." One of Pink Floyd's best-loved songs and one of Waters' best basslines - via a shed, a Revox loop and shedloads of tape. Here's how they recorded it. Waters is best known as Floyd's supreme songwriting overlord - but his bass skills are pretty tasty too. Check out the bass work (and tone) on the section after the transition here at 7:37 - not only is it a filthy groove but it's completely driven by Waters' authoritative playing. See how he plays just centimetres from the bridge and digs in hard with the pick - it's an absolutely frightening sound and, judging by the timbre, frighteningly loud too. Here's a beautiful solo acoustic version of Dark Side Of The Moon's Brain Damage, played with such shivering melancholy that it makes you wonder whether the album version's gospel choirs and epic bombast was actually a better option than simply having a great singer-songwriter play an old acoustic guitar. The Wall was Waters' most ambitious project. Its making was so fraught it caused Pink Floyd to implode, but it's probably what Waters will be best remembered for. Here's Mother live, with Waters on acoustic guitar, trading lead vocals with David Gilmour. Or, at The Wall concert (1990) in Berlin with Sinead O'Connor on vocals. This scene ('reel 13') of Hey You was omitted from the The Wall movie, through fears the film was already too long. Maybe the song was just too bleak? Waters doesn't do 'happy' as a writer. Hey You puts his and David Gilmour's vocals in stark contrast, with the song sounding increasingly fraught as Waters takes over. Pink Floyd, when Waters was in charge, were never a party band.